Well Tomorrow is the 1st of December (it really seems to come round quicker each year) and this year as well as J’s chocolate advent I have made us as a family a Reindeer advent calendar for our advent of activities for December. So tomorrow morning J will come down stairs and Rudolph will be there with his envelopes with activities in for us to do as a family. Our activities are varied from crafts, and family outings to traditional Christmas celebrations including taking J to our local church’s services for children something that we haven’t managed to make before. Rudolph also makes a great card holder. I will post later in December on how to make him. With our own advent going on it also gives me great pleasure to be part of the 2011 Creative Christmas Countdown organised by Alissa over on Creative with Kids. A team of 24 bloggers from around the globe will be bringing you 24 creative ways to make the lead up to Christmas magical and creative every day. Each day I will post up the link on the facebook page to the blog with the day’s activity and also a small post on the blog about it. I will also post up some of our advent activities as well and some christmas themed crafts during December. A free printable of all of the activities for advent can be found on Creative with Kids if you would like to know what is coming in advance. I really hope you all enjoy the countdown to Christmas and this years advent activities as much as we do. 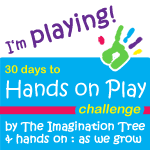 On Day 23 of the 30 Days to Hands on Play The Imagination Tree set the Challenge of Printing. Now over the summer I tried this with J wanted to print a castle as we had visited one and had the idea to use megablocks to do it – but J had other ideas and the activity led to me writing the post “How do you do messy play” as it really didn’t go to plan at all. So being given the prompt I thought why not have a go. Now J and had been watching In the Night Garden during our lunch and decided to we were going to make a snowy picture for In the Night Garden – so we got out Upsy Daisy and decided she was going to walk in the snow. J was then insistent that there had to be a ball (for anyone that hasn’t seen it a ball features in a lot of episodes of the programme) so a pom pom was found to use for making the ball prints and then due to the episode being about the Tombiloo building blocks – we also had to use a block for the printing as well. J printing with Upsy Daisy "Walking in snow"
I set up the table for J with the card, his chosen objects and the white paint (although we had issues with him thinking it was glue as it comes in the same bottle as the glue does!) and he started printing.First Upsy Daisy walked across the page leaving “Snowy Prints Mummy – Upsy Daisy Walks” and he had great fun making the marks of her going across the card. Then the bouncy ball came into action and the pom pom was bounced across the page leaving “CIRCLE MUMMY CIRCLE”. Then the block was taken into action – it was interesting to see him first print with the base – a square, then the side – rectangle and lastly the top – a circle. Of course at this point T woke from her nap – and I popped up stairs to get her and came down to find him printing with his hands – there was to quote him “SNOW STORM MUMMY – upsy daisy cold”. At which point it was clean up and let the picture dry. With Christmas around the corner. We’ve started on the Christmas themed crafts and yesterday we made a Santa Collage. Collage’s are a great way to use lots of different skills with Toddlers and J loves getting messy and using different equipment. As Santa is featuring heavily in his vocabulary at the moment it was a perfect opportunity to introduce it and we talked about what Santa does whilst we made the collage. I quickly drew a very rough santa outline for J and I to use as the basis for our collage – it doesn’t matter how bad or good an artist you are – the benefit for having a toddler is that they think your drawing is amazing what ever it is like. Using red tissue paper we did J’s favourite tearing activity and tore the tissue paper into small pieces – then put the pieces to the side so we could glue the hat of the santa. J tried to keep within the lines but it really didn’t matter if it went over the lines as we will be cutting out the dry santa to put it on the wall. Then I gave J a piece of tissue paper which he scrunched up and we put on the hat to colour in the hat red. J loved this bit as he got to “Scrunch”. We then chose a pompom for Santa’s nose – luckily I have a cold at the moment so looking at mummy’s nose meant that we were able to have a Santa without a Green nose which was his first choice however it does mean that instead of the nice flesh coloured pompom that I thought we would use we have a very pink one. Then came J’s favourite part – He glued all over Santa’s beard area and then added cotton wool balls to make the beard, then the hat and a pom pom onto the hat as well. In the lead up to Christmas last year I got together with Faithful Mummy and we created our christmas cards for family members. At the time mini faithful was 9 months old and J was 15 months old and T was yet to be born. So this is a perfect first christmas card from a baby to family members and was easy to do. We spread newspaper over the kitchen floor as this was easier than trying to do this in high chairs at the time and stripped both of the babies to their nappies as we knew it would get messy with 2 crawlers around. Into shallow dishes we put green paint for the trees and holding J’s hand I helped him make a hand print on the card blank with his palm as the base of the tree and his fingers as the branches. I did a set of cards at a time and put them aside for drying while we did the 2nd style of card. For our 2nd card I choose reindeer to do this we did a footprint in brown paint and then 2 hand prints for antlers in a yellow paint. Once the cards were dry J helped me add glitter using glitter glue and stars to the cards to decorate the tree (I drew an outline of a tree around his hand) and make the reindeer have a red nose. I then added a peel off to say Happy/Merry Christmas to the cards. As these were sent to family I also put J’s age inside as I know some of the family will keep them as memories of cards from him in the future. With the changing of the clocks and seasons J is suddenly able to see the night sky and he is fascinated by it. He comments about it being dark, late, we’re taken to the window to see the sky – look for stars and he’s started to notice that the moon changes as to quote him “Moon not circle Mummy” as it starts to wane to a new moon (how am I going to explain where it’s gone if the sky is clear when it’s a new moon I don’t know! – maybe that should be a question for Science Sparks on their Friday questions. So as he’s not been to well and seemed to perk up a little after a nap I decided to do some cheats sky at night play dough for him to play with. You could make your own play dough there are many different recipes on the internet for how to make it but I needed something quick so it was ready-made mini tub play dough from a party bag that we used. I helped J to sprinkle some glitter in an ice-cream tub and then we added some mini stars that I had in my own craft kit and some larger stars as well. He of course was quickly covered in glitter but loved helping to sprinkle the sparkly stuff everywhere. We then added the black play dough and rolled it around – pulled it apart and added some glitter to the middle and then joined it together again. Using a rolling-pin we flattened the play dough and then made mounds of it and added some paper to be a moon which was a “crescent” – an app for the i-phone has apparently taught him crescent as a shape! When he finished playing with it – I put it back in the little tub and when we got it out again today it was great and ready to use to play more with the night sky. Not really a theme as such this week – instead I asked J to choose 5 of his books to read this week for our 5 a day books. If you are interested in the idea and want to find more see The Imagination Tree. 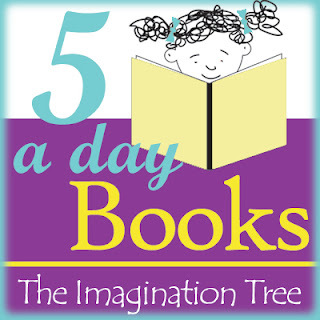 I will also be linking up to the weekly link party that is run by The Imagination Tree with our 5 a day books. So here’s J’s choice for the week. Guess with Jess is a Tv programme on Cbeebies channel and is one of J’s favourites when it is on. The idea is that Jess sets himself something to discover each episode and this book follows a similar idea with Jess exploring around the farm where he lives – it introduces concepts like growth, colours, fear, mini beast, counting and sounds. J loves the book and it’s already been read 4 times since coming down stairs this morning. J has always loved the That’s not my series of book and this weeks selection include his 2 favourite of the moment. That’s not my Lion is a lovely book and what I think is the nicest that when he chose the book he said “For T as soft Lion in”. He’s sat with T and read it to her this morning. Our 2nd That’s not my book is that’s not my teddy bear – again it’s lovely and soft. As I write this T is pulling on the fuzzy ears in the book. Even though she isn’t repeating what is been said the books are great for her – they explore textures and frequently opposite texture e.g. rough and smooth. They are also short and because they are board books easy for her to manipulate. 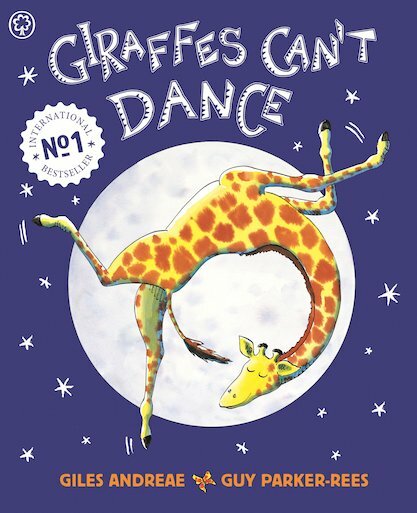 We have 2 copies of the next book – Giraffe’s can’t dance – one stays upstairs and is a lovely paper back edition and the other is a board book that has been chewed, dropped in puddles and taken everywhere with us for a little while. J loves the colourful pictures in the book and the dance moves of the different animals are great. We will be acting out the dance moves later for today’s 30 days of hands on play challenge over on Hands on: as we grow – which will also give us a great excuse whilst J and T are under the weather to get some activity going on. Our last book is a favourite bedtime book for us. One bear at bedtime. All about the different things that the little boy in the story has to deal with before bedtime – including snakes, crocodiles, caterpillars, kangaroos, pigs and a monster with 10 heads. It is also great for helping with numbers both recognising numbers and counting – both of which J is fascinated with at the moment. It’s now starting to get colder and finally it looks like Autumn could be here (unlike October where at one point we had the paddling pool out in the garden!). So for us a lot of the time is spent indoors. When The Imagination Tree set the challenge on Day 11 of the 30 Days to Hands on Play to get Outside I thought GREAT. And we did. – Now I know it’s not a “Rainy Day activity” or adventure and not exactly a how did we go about it. But it was so much fun. At the time it wasn’t rainy but I think we would even have got out in the rain as J has now got an all in one puddle suit that we managed to pick up in the sale and T will fit into an old one of his with lots of rolling of the arms and legs so she can crawl around. We chose to go to the forest with Rainy Day Pops, now there was a secret aim for this – to find some pine cones to use in an activity in the near future that were the right size for the project but even so it was fun. We took a football and a rugby ball with us and the buggy for T.
So we went and walked around the forest, played in the leaf piles, looked at the wood sculptures (it’s amazing what people can do with a chain saw) and then went to the adventure playground where there was a fabulous slide and fort combination that J just wanted to go up and down and up and down again. Thank you for the suggestion of getting out and about Jamie (from Hands on: as we grow) and Anna (The Imagination Tree). I’m now going to try to get out and about every day with J even if just to our local park – only thing is to work on road safety with him as have a cross a fairly busy road to get there. Welcome to Rainy Day Mum - making every day fun. I am a stay at home mum to 2 energetic toddlers and came up with the idea of rainy day mum when we were sat at home and I wasn't sure what to do with J. 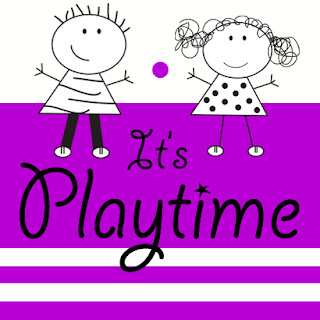 So Rainy Day Mum was born each of the ideas/activities is tried and tested by J and/or T.
Enter your email address to receive news of new ideas by email.